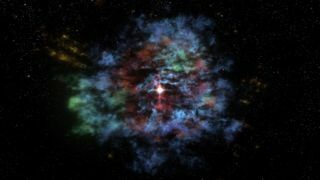 A still from a new 3-D movie that flies through supernova grave that is Cassiopeia A. The dying remains of anexploded star have been resurrected in a new three-dimensional film that fliesthrough the ancient supernova. At center stage inthe new movie is Cassiopeia A, a dead star that exploded about 330 yearsago to forge one of the youngest supernova graves in the Milky Way galaxy. Astronomers usedobservations from several ground- and space-based telescopes to build the 3-D voyagethrough the supernova, which starts at the remnant?s neutron star core. The moviethen pulls back to reveal the wispy, gaseous remains ofCassiopeia A in hues of red, green, yellow and blue to mark materials seenin different wavelengths. "We have always wantedto know how the pieces we see in two dimensions fit together with each other inreal life," said Tracey Delaney of the Massachusetts Institute ofTechnology, whose team reconstructed the event. "Now we can see forourselves with this 'hologram' of supernova debris." The movie and a separatestudy on the same supernova remnant were announced this week at the 213thmeeting of the American Astronomical Society in Long Beach, Calif. In the separate study,astronomers collected a series of time-lapse images of Cassiopeia A?s recent evolution usingeight years of observations from the ChandraX-Ray Observatory. That study found that 30 percent of the supernova?senergy ended up as high-speed cosmic rays. And by virtually flyingthrough thesupernova remnant, scientists discovered two separate components: aspherical outer shell and a flat, disk-like inner layer. Jets of silicon andiron were spotted in the inner disk, but scientists were surprised to see theirbroad, disk-like structure, researchers said. The finding suggests that theinnermost layers of an exploding star erupt as high-speed plumes, while theoutermost regions expand like a spherical bubble. "With Chandra, we havewatched Cas A over a relatively small amount of its life, but so far the showhas been amazing," said astronomer Daniel Patnaude of the SmithsonianAstrophysical Observatory in Cambridge, Mass. "And, we can use this tolearn more about the aftermath of the star's explosion."